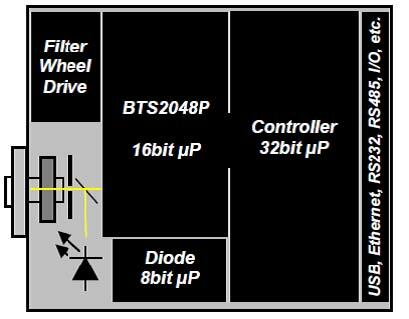 The BTS2048-VL employs the Gigahertz-Optik BiTec Sensor Technology which combines a photopic filtered photodiode for integral measurements and a CCD array spectrometer for spectral measurement. Three microprocessors are used to control the instrument, an 8-bit for the photodiode, 16-bit for the CCD and a high power ultrafast 32-bit (200MHz) to control the entire system. A diffuser input optic is installed for a cosine corrected measurement geometry, a prerequisite for accurate illuminance measurement. Light entering through the diffuser is shared between the photodiode and CCD within the same field of view. The spectral components of the BTS2048-VL include an entrance slit, collimating mirror, diffraction grating, focusing mirror and a 2048 pixel CCD with a 'Crossed Czerny Turner' design. This optimized optical design helps to minimize aberrations and scattered light. The spectral data measured by the CCD is used for on-line correction of any spectral mismatch error of the photopic filtered photodiode.